Many people dream of leaving their corporate jobs to focus on their passion projects full-time. 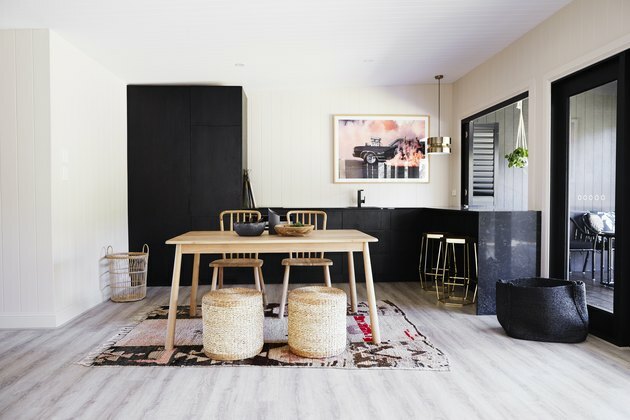 Those dreams became the reality for three best friends in Australia who formed the design company Three Birds Renovations. 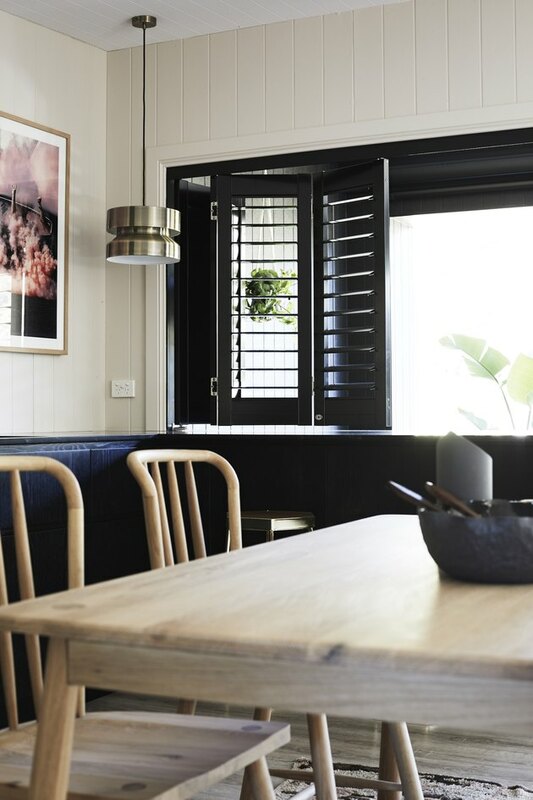 With impeccable style and the handy skills to build beautiful spaces, the three designers have created a name for themselves, renovating spaces to make them feel airy and comfortable. The trio even launched their own Reno School, empowering others to renovate their own homes. Before, the home was quite small and in bad shape. "​It was originally​ just a derelict caravan with outdoor awning. 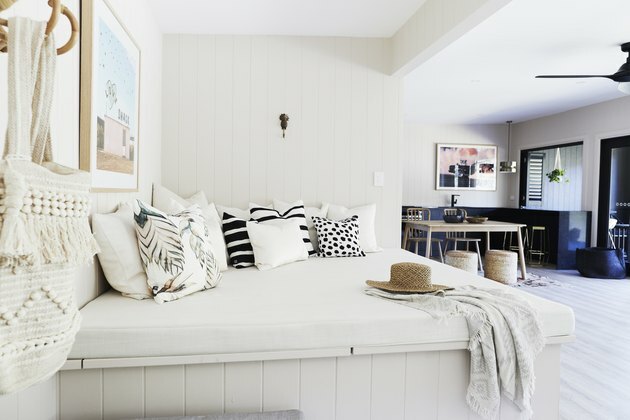 We transformed it into the ultimate weekender by building a house around the caravan and making the caravan one of the internal rooms," Lana Taylor, one of the three, said of the home. 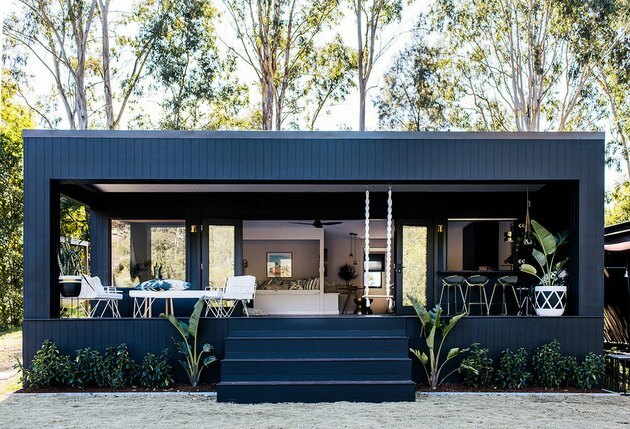 Although many of their other projects are known for their all-white, tidy, and minimalist designs, for this design they opted to add more color and dark spaces to create a modern cabin feel. "We wanted it to fit in with the leafy bush surrounds," Taylor said. The end result is a small cabin that can accommodate up to 11 people for an ideal weekend away. In order to blend the home and the caravan, the trio opted for Axon Grained Wall Cladding from SYCON WALLS. And, of course, no weekender in the woods is complete without an outdoor shower. The renovation team opted to go with a shower from Mon Palmer. A few of the furniture pieces are from BoConcept including the Istra 2 sofa, Zaroj rug, and Veneto armchair. The designers chose to layer BoConcept Bornholm coffee tables in two sizes and tones. Perhaps what is most amazing about this kitchen is what you don't see. Top of the line appliances from Fisher Paykel are coupled with custom cabinets from Carrera by Design for a minimalist composition. Light colored floors supplied by Godfrey Hirst still deliver on the cabin charm. 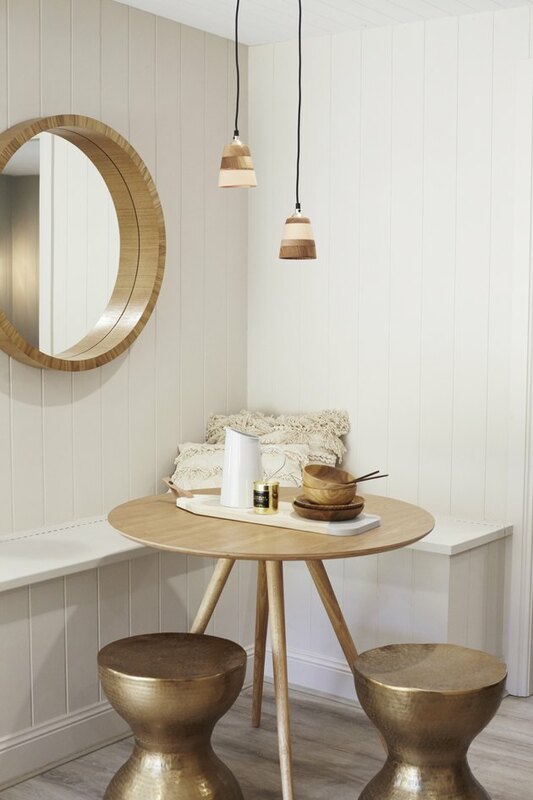 In the style of the light-colored floors, the Wycombe Dining Table is paired with Wycombe chairs purchased from Gallery Direct Australia. Because of the home's location on the river, weatherproof shutters, like the aluminum outdoor shutters from Luxaflex, are a must. When a home that is short on square footage needs more comfortable shared spaces, the solution can be building a nook with built-in seating. 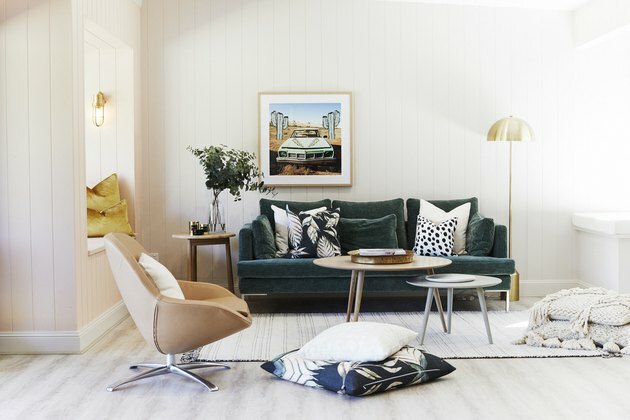 For flat seating, providing the right cushions are must which is why these designers opted for muted-colored and textured cushions from Sea Tribe. A minimal space needs minimal lighting. For this nook, designers went with The Mini 'Dreamer' Pendant, a hand-crafted style. "We used the cladding inside on every surface (including the ceiling) for a traditional cabin feeling but with a modern twist," Taylor said. Ceiling cladding is Hardie Groove by James Hardie in a Summer Cloud Quarter color from Dulux. Wall cladding from Scyon Walls continues into the private spaces. For a small weekender, comfort is the main function of the bedroom which is why the team used luxurious 100% French Flax Linen Valance from Society of Wanderers for the bed. The use of an Ariah Round Mirror adds a bit of nautical whimsy to the design. 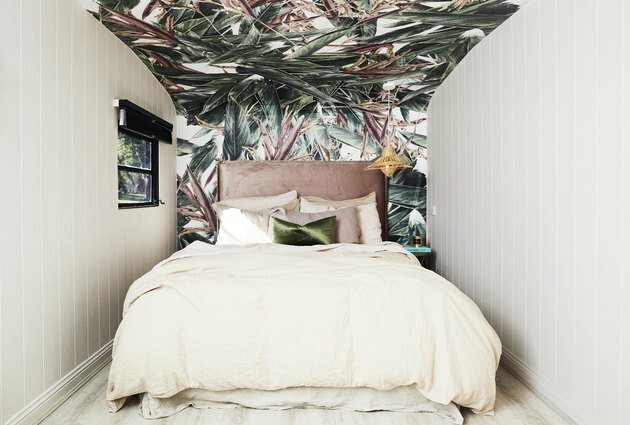 Watercolour Strelitzia Wallpaper from Luxe Walls becomes the main decorative element in a bedroom with little space for shelves or decoration. 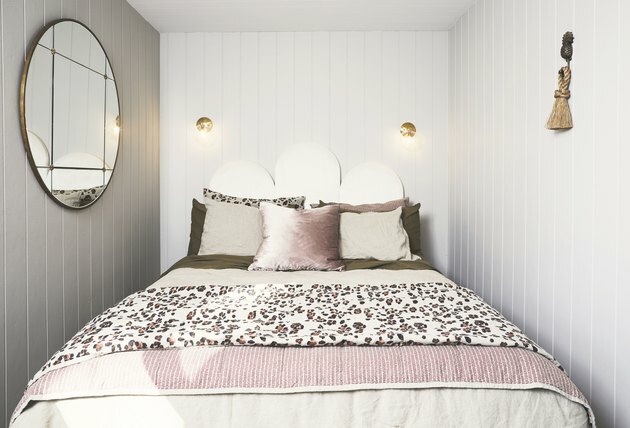 A Rupert headboard by Heatherly Design Bedheads presents a soft texture and compliments the wallpaper pattern. 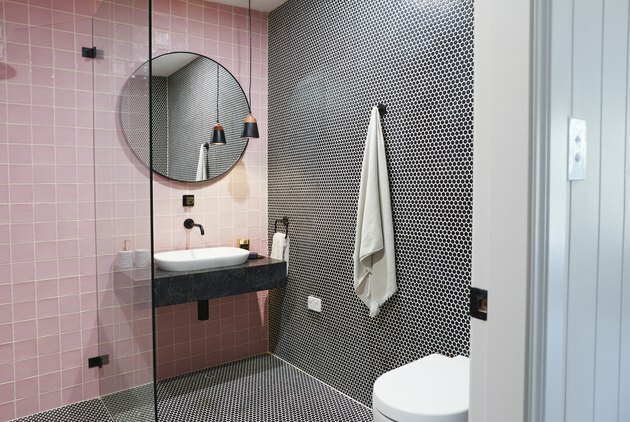 The bathroom design continues the dark and light color scheme by mixing two distinct tile designs by Amber Tiles Kellyville. 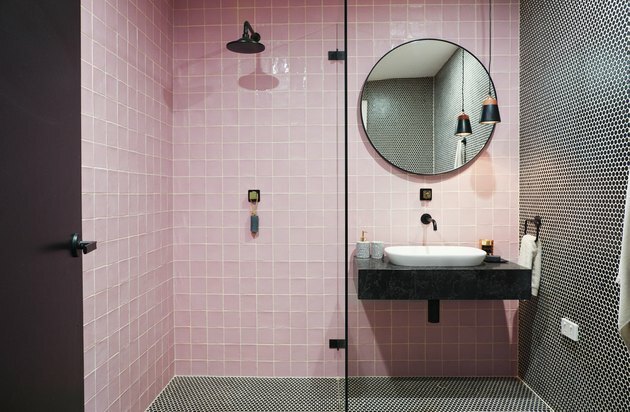 The round mirror, in a similar fashion to the ones found in the bedroom and dining room, is mounted on the pink side, reflecting the black tiles from straight-on. The team paid special attention to detail, even when choosing articles for the bathroom. A Vanilla Noir Vanity Top by Caesarstone seemingly floats above the floor, in a similar fashion to the other details, including the porcelain soap dispenser from H&M Home.